A screen capture from "Drag Me to Hell"
In mid-January, news spread quickly that the new owners of the iconic Norms restaurant on La Cienega had been issued a demolition permit for the property. The Los Angeles Conservancy immediately stepped in, voting unanimously to place the Googie-style eatery under consideration for Historic-Cultural Monument status. While the move protects the structure for the next few months while the City Council decides whether or not to approve the nomination, the restaurant’s fate is still very much up in the air. The Norms chain was founded in 1949 by a former used car salesman named Norm Roybark, and the first outpost was situated at the corner of Sunset and Vine in Hollywood. The La Cienega diner, located at 470 N. La Cienega Boulevard. in Beverly Grove, was established in 1957 and has been open 24 hours a day, 7 days a week ever since. The unique, cantilevered-roof structure was designed by prolific architects Louis Armet and Eldon Davis. Despite the fact that Norms once dotted the Los Angeles landscape, many have closed in recent years. La Cienega is the oldest of the surviving branches. In December of last year, the Roybark family announced they’d sold the chain, but gave assurances that “the new owners were carefully selected to protect the legacy of Norms.” Unfortunately the chain was sold to one party and the land and actual restaurant structures to another. The Norms building on La Cienega is now owned by a West Hollywood developer. It is he who filed for the demolition permit, though apparently no plans to raze the site are or were ever in place. Norms was featured in the 2009 Sam Raimi-directed horror film Drag Me to Hell. The movie centers around a young banker, Christine Brown (Alison Lohman), who is cursed to death by a gypsy. The only way Christine can save herself is to give a hexed button, and thereby the curse, to someone else. Towards the end of the flick she is shown sitting at Norms looking for a candidate. When she cannot find one, she calls her work nemesis, Stu (Reggie Lee), and attempts to pass her bad fortune on to him. Let’s just say that things do not turn out happily. 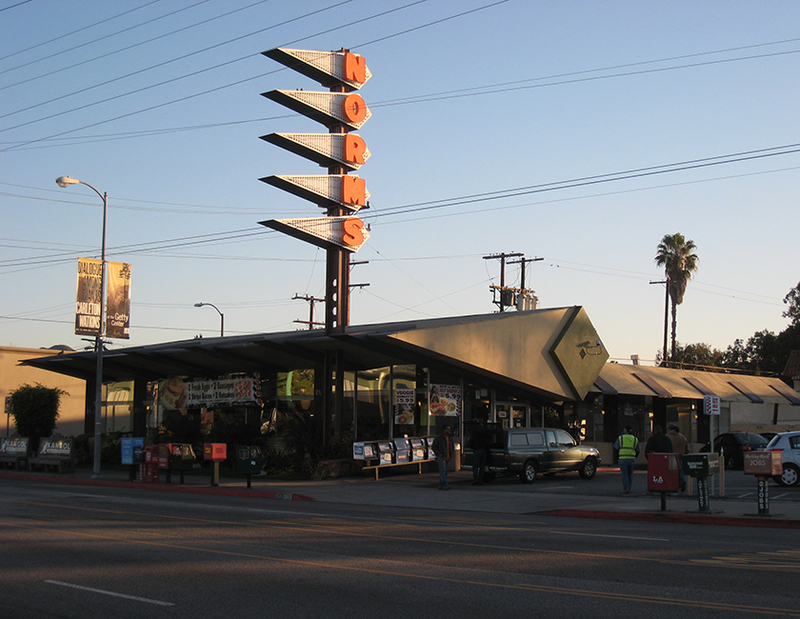 The La Cienega Norms was also featured in a photograph in Teenage Fanclub’s 1995 Grand Prix album. The Van Nuys location, at 13640 Sherman Way, appeared in the pilot episode of Men of a Certain Age. When the series was picked up, a replica of that Norms was recreated on a soundstage at Paramount for the filming of all subsequent episodes. My fingers are crossed for a positive outcome for Norms. I certainly hope the restaurant fares better than Christine in Drag Me to Hell.